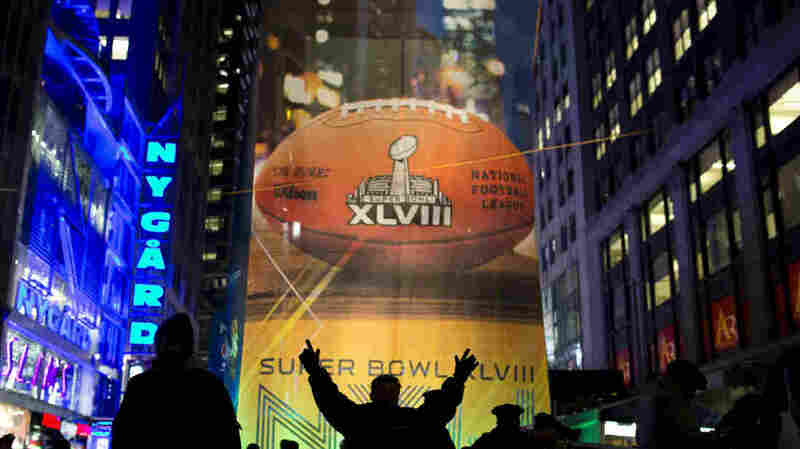 5 Points To Help Simplify Sunday's Super Bowl : The Two-Way Ahead of Sunday's Super Bowl XLVIII, NPR's Mike Pesca dams up the river of hype to create a cool lagoon of Super Bowl reason. Fans gather on the Super Bowl Boulevard in Times Square on Friday in New York. The Seattle Seahawks will play the Denver Broncos on Sunday in NFL football's Super Bowl XLVIII in East Rutherford, N.J. The chatter, hype and jargon in the weeks leading up to Sunday's Super Bowl XLVIII is more impenetrable than the Seahawk's secondary. Perhaps you've heard the Seattle Seahawks have a running back who enters "Beast Mode." Maybe you've heard that the Denver Broncos' counter to Beast Mode is a defensive lineman nicknamed "Pot Roast." Peyton Manning's brain is the most valuable organ in sports. The Denver quarterback changes plays at the line of scrimmage and will always find the defense's weakness. The Seattle defense might not have a weakness. They're the best in football; the Broncos offense hasn't faced a unit remotely as good as the Seattle defense. The Seattle defense hasn't faced a unit remotely as good as the Denver offense. The Denver defense, though beset by injury, played well against the Patriots and also against the Chargers for about three-quarters of a game. Seattle's quarterback, Russell Wilson, threw the ball less than any other QB with at least 12 starts; therefore his wide receivers had paltry numbers. But they almost never drop the ball, and they lead the league in yards per catch. In other words, the Seattle offense is secretly pretty good. OK, so we've dammed up the river of hype and created a cool lagoon of Super Bowl reason. Breakfast: Fleming adheres to zone-read concepts, she'll nibble on toast while zoning out and reading The New York Times. Though she'll normally line up her strips of bacon in a 4-3 alignment, if she's having donuts she'll occasionally stack the box within a six-glazed front. Should Rene sense the opportunity, she'll go against tendencies and, deploying a bagel as her edge setter, drag her toast between two eggs over-easy quickly. This is known as the double-egg-gap blitz. Dress: Fleming will show gloves, but occasionally flash mittens. If there is enough time on the clock, she has been known to audible out of a parka and into an overcoat, perhaps in an attempt to disguise her Cover 1 look. If the members of her backing orchestra get cold, she will drape them all in a blanket, the "Cover 3." The New Jersey Symphony Orchestra: Perhaps because its members don't sing, the New Jersey Symphony is the unsung unit in today's game. Also, the music is prerecorded. Pay particular attention to the notes of violist Elzbieta Weyman, a free agent out of Juilliard who was signed off the street (well, technically the plaza surrounding Lincoln Center). Elzbieta has good straight-ahead speed on the strings, is comfortable playing the three-technique or the Suzuki style, and has what one scout called a "high Viola IQ." Questions about her commitment were answered early on when she played half a movement with a broken bow, drawing comparisons to Jack Youngblood or a young Yuri Bashmet. Elzbieta prefers a viola case with a lock-down corner. After her playing career is over, she'd like to go into coaching or open a chain of viola-themed car washes.